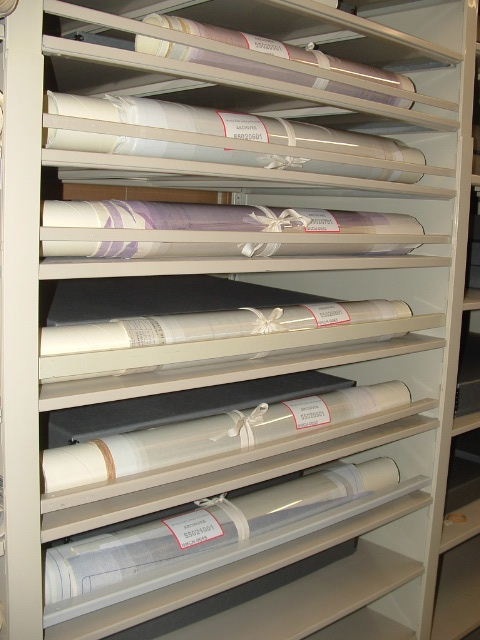 Map storage in the State Archives protects and preserves documents. State Archives control number DSCF-0060. Statements of ethics emerge from the core values of a profession. The Core Values of Archivists and the Code of Ethics for Archivists are intended to be used together to guide archivists, as well as to inform those who work with archivists, in shaping expectations for professional engagement. The former is a statement of what archivists believe; the latter is a framework for archivists' behavior. Archives are created by a wide array of groups and provide evidence of the full range of human experience. Archivists endeavor to ensure that those materials entrusted to their care will be accessible over time as evidence of human activity and social organization. Archivists embrace principles that foster the transparency of their actions and that inspire confidence in the profession. A distinct body of ethical norms helps archivists navigate the complex situations and issues that can arise in the course of their work. The Society of American Archivists is a membership organization comprising individuals and organizations dedicated to the selection, care, preservation, and administration of historical and documentary records of enduring value for the benefit of current and future generations. The Society endorses this "Code of Ethics for Archivists" as principles of the profession. This Code should be read in conjunction with SAA’s “Core Values of Archivists.” Together they provide guidance to archivists and increase awareness of ethical concerns among archivists, their colleagues, and the rest of society. As advocates for documentary collections and cultural objects under their care, archivists aspire to carry out their professional activities with the highest standard of professional conduct. The behaviors and characteristics outlined in this Code of Ethics should serve as aspirational principles for archivists to consider as they strive to create trusted archival institutions. Archivists cooperate and collaborate with other archivists, and respect them and their institutions’ missions and collecting policies. In their professional relationships with donors, records creators, users, and colleagues, archivists are honest, fair, collegial, and equitable. Archivists exercise professional judgment in appraising, acquiring, and processing materials to ensure the preservation, authenticity, diversity, and lasting cultural and historical value of their collections. Archivists should carefully document their collections-related decisions and activities to make their role in the selection, retention, or creation of the historical record transparent to their institutions, donors, and users. Archivists are encouraged to consult with colleagues, relevant professionals, and communities of interest to ensure that diverse perspectives inform their actions and decisions. Archivists ensure the authenticity and continuing usability of records in their care. They document and protect the unique archival characteristics of records and strive to protect the records’ intellectual and physical integrity from tampering or corruption. Archivists may not willfully alter, manipulate, or destroy data or records to conceal facts or distort evidence. They thoroughly document any actions that may cause changes to the records in their care or raise questions about the records’ authenticity. Archivists protect all documentary materials for which they are responsible. They take steps to minimize the natural physical deterioration of records and implement specific security policies to protect digital records. Archivists guard all records against accidental damage, vandalism, and theft and have well-formulated plans in place to respond to any disasters that may threaten records. Archivists cooperate actively with colleagues and law enforcement agencies to apprehend and prosecute vandals and thieves. Recognizing that use is the fundamental reason for keeping archives, archivists actively promote open and equitable access to the records in their care within the context of their institutions’ missions and their intended user groups. They minimize restrictions and maximize ease of access. They facilitate the continuing accessibility and intelligibility of archival materials in all formats. Archivists formulate and disseminate institutional access policies along with strategies that encourage responsible use. They work with donors and originating agencies to ensure that any restrictions are appropriate, well-documented, and equitably enforced. When repositories require restrictions to protect confidential and proprietary information, such restrictions should be implemented in an impartial manner. In all questions of access, archivists seek practical solutions that balance competing principles and interests. Archivists recognize that privacy is sanctioned by law. They establish procedures and policies to protect the interests of the donors, individuals, groups, and institutions whose public and private lives and activities are recorded in their holdings. As appropriate, archivists place access restrictions on collections to ensure that privacy and confidentiality are maintained, particularly for individuals and groups who have no voice or role in collections’ creation, retention, or public use. Archivists promote the respectful use of culturally sensitive materials in their care by encouraging researchers to consult with communities of origin, recognizing that privacy has both legal and cultural dimensions. Archivists respect all users’ rights to privacy by maintaining the confidentiality of their research and protecting any personal information collected about the users in accordance with their institutions’ policies. Archivists should not take unfair advantage of their privileged access to and control of historical records and documentary materials. They execute their work knowing that they must ensure proper custody for the documents and records entrusted to them. Archivists should demonstrate professional integrity and avoid potential conflicts of interest. They strive to balance the sometimes-competing interests of all stakeholders.